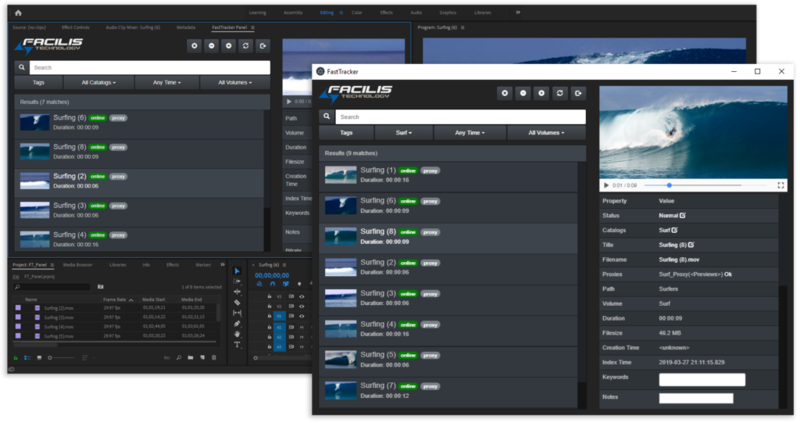 Included with every Facilis system, Facilis delivers the fastest way to index, tag, search, and access your video, audio and still format media across Facilis volumes using our media and video asset management system. FastTracker supports 1 million+ asset records and is completely integrated with Facilis server software. 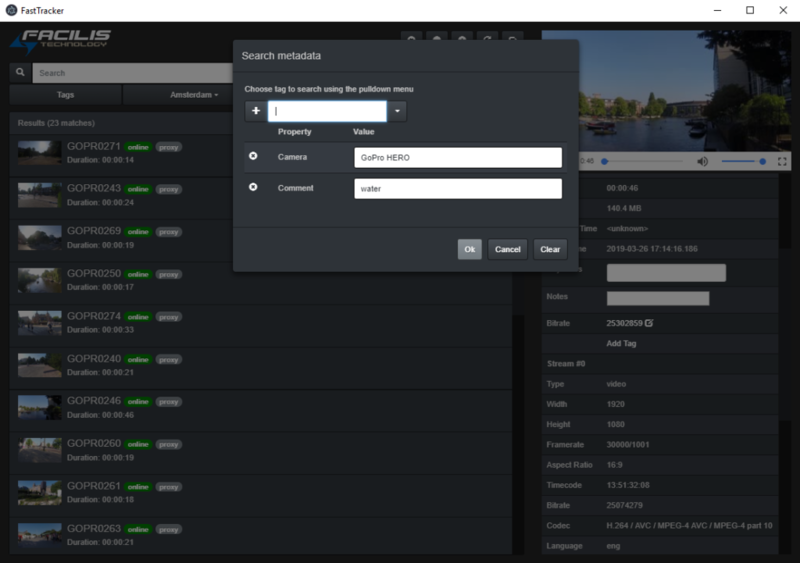 Our FastTracker 3.0 release includes even more flexibility with expanded options for tracking third-party storage locations (network shares, direct-attached storage, cloud, and more). Using FastTracker, you can develop a custom workflow from ingest to edit and delivery, without the bloat of traditional MAM systems. Easy to learn and quick to use, you'll find this asset tracker to be a huge benefit in almost any workflow. 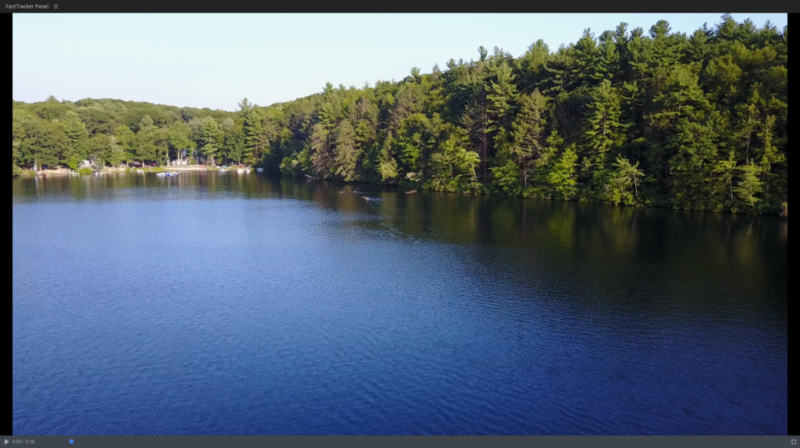 Call us today at (978) 562-7022 to learn more about what is included in our video storage servers. Even small facilities can have hundreds of terabytes of files across multiple hard drives, network locations, and online shared storage. Managing the access and location of these files can be a challenge, wasting time that should be used for production. 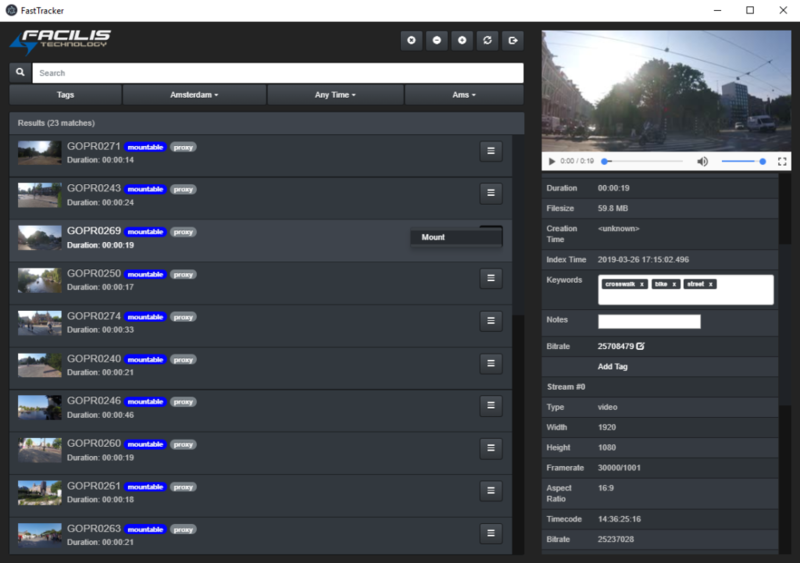 FastTracker is a media asset management system that is designed to be a fast way to index, catalog and find your video, audio, and still image files across Facilis volumes, network drives, and local storage. 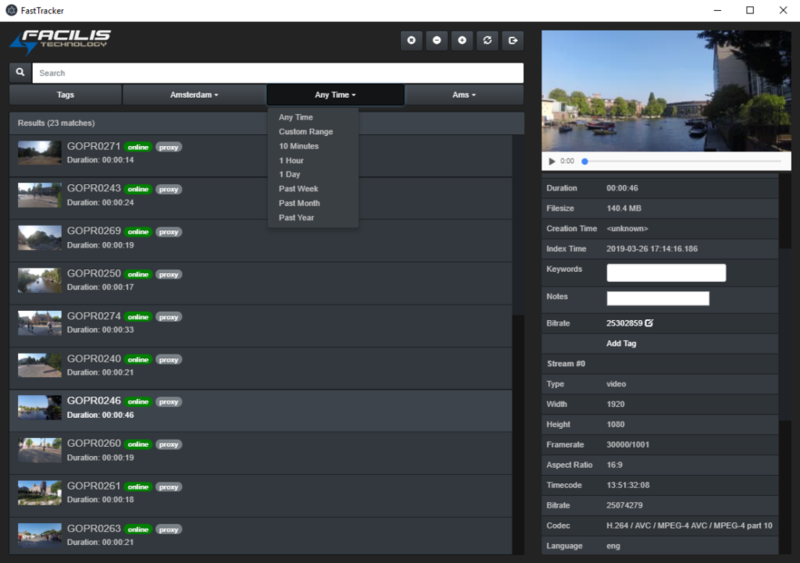 New in FastTracker 3.0 are expanded proxy generation options, which include preview, HD, and same-as-source resolutions in addition to on-demand transcodes, automatic transcodes at index time, and various quality/speed settings. FastTracker 3.0 also introduces a Desktop Browse panel that brings the existing Adobe Panel to all users, with new features and functionality that are also included in the Adobe Panel. Indexing can be automatic on a global scale, by watch folder for specific catalogs, or manual with drag-and-drop of folders. Catalogs can be assigned permissions just like Facilis virtual volumes, and asset records can be assigned to one or more catalogs. Metadata tags are customizable, to add as much useful data to asset records as possible. A media player for full resolution content is included, supporting desktop playback of hundreds of formats and codecs. There is no external workstation required for FastTracker, as the software, database, and encoded proxies are stored on the Facilis server. 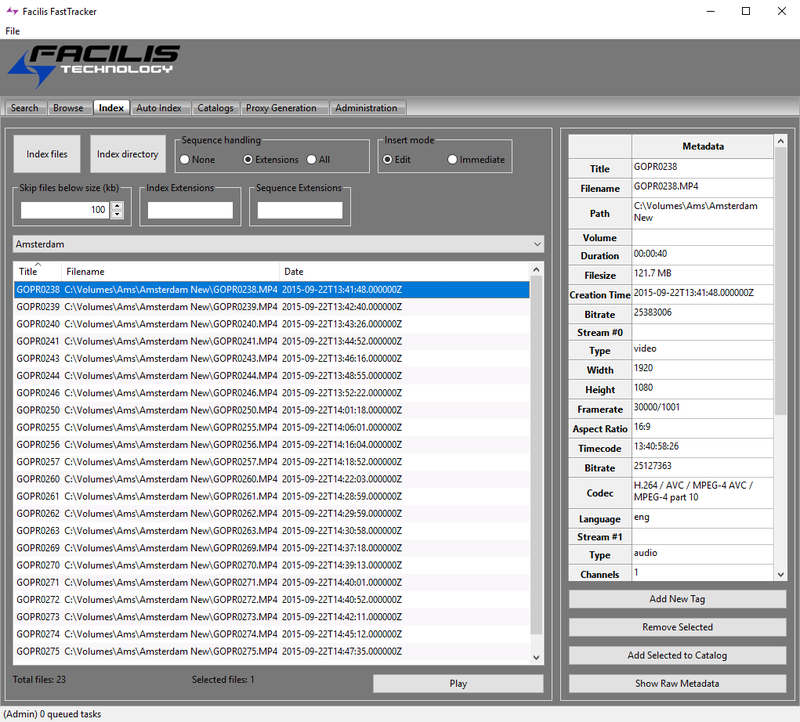 Auto Index and catalog all incoming files on Facilis volumes without manual interaction. Encode Proxies at preview, HD, and same-as-source resolutions, automatically at index time or on-demand. Catalog and encode proxies for archived video, for management of offline projects. Filter unwanted files with index filters based on file extension and size. Manage access to indexed data through per-catalog user permissions and password protection. Search assets based on imported/custom metadata, Boolean terms, index time, tag content, and more. Access assets directly from FastTracker Desktop Browse or Adobe Panel, and drag/drop directly to the current application. View the latest FastTracker Panel video here.